Earlier this week we said that the Terps had to come home to College Park today and realize that they are no longer playing Bowling Green. Well the end result on the offensive end looks as if they may have left their scoring in Ohio as the Temple Owls came and dominated the Terps from beginning to end and emerged with a 35-14 victory. Redshirt freshman quarterback Kasim Hill finished with a lackluster performance of 7 for 17 on only 56 yards. Yes that’s right, 56 yards. Their total for the day was just 195 yards, 107 of that came on the ground from Anthony McFarland on 11 carries. So what happened that was positive for the Terps today, defense. The only thing they showed was Darnell Savage’s interception and the Jesse Aniebonm blocked a punt and returned it 27 yards for a touchdown. Big Deal right? Well if they didn’t do any of that the score would have likely been much worse. 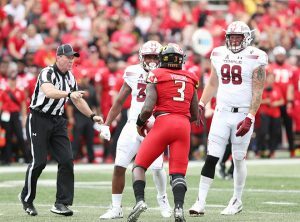 Hill did exhibit some ability to get it down the field, but missed on two big plays, one drop in the end zone in the third quarter and one thrown out of bounds to the left end zone early in the fourth were the only real attempts to get the ball into pay dirt for the Terps. While they were winless prior to today, the Owls just appeared to be the better all around team. They ran the ball and burned clock when they needed to and they made big plays to keep the offense on the field when they needed to as well. Maryland faces another big test next week as they face Minnesota at home and then take the road the following week to face Michigan. They could very well end September with 2-3 record leaving the question, when will D.J Durkin return, if ever?